LOOKS AS THOUGH TV3′s decision to ditch two hours of programming for some seriously apocalyptic storm footage paid off. 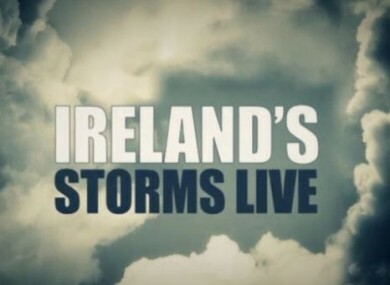 The station claims that a total of 952 thousand people tuned into their coverage of the wild weather on Wednesday night, with an average of 250 thousand viewers watching Ireland’s Storms Live at any given time. Sure don’t we just LOVE any excuse to talk about the weather? Being able to watch it on the telly and through the window at the same time was bound to be a rather popular option. TV3 says a snap decision to produce a two-hour segment on the storms was made on Wednesday afternoon, as weather conditions around the country began to deteriorate rapidly. It was a case of “all hands on deck” in the broadcaster’s Ballymount headquarters, where news anchors, reporters, journalists and sports reporters were called upon to contribute to the coverage. This programme is a testament to the exceptional staff working at TV3 who all chipped in to deliver this winning news special just a few hours before broadcast. This is public service broadcasting at its best, with the immense figures proving that TV3 will go to great lengths to bring viewers relevant content of significant importance. Meanwhile, RTE’s storm coverage on the Six One news reached around 973 thousand viewers, with an average of 663 thousand tuning into the bulletin. Email “"Almost 1 million people" have watched TV3's apocalyptic storm coverage”. Feedback on “"Almost 1 million people" have watched TV3's apocalyptic storm coverage”.